Our client built 6 stunning townhouses in the beautiful Suffolk town. For one of them we were tasked with liaising with the purchaser, to bring to life their vibrant vision. The cabinets are porter handless, enhanced by the oak light-boxes on the peninsular bar. Various pullout systems and wirework were added. A Rangemaster was chosen as the centre piece, together with Siemens, and Bosch appliances, and a Caple wine cooler. The worktop 20mm Neolith - Beton Suede. The walls were decorated with 6mm coloured glass. The Utlity Worktop was Egger Wood effect. A visually attractive and ultimately practical kitchen. The Litchfield was perfect for the requirement of clean lines while retaining a traditional feel, for this Essex farm development. The colour stone was chosen from the extensive choice available. 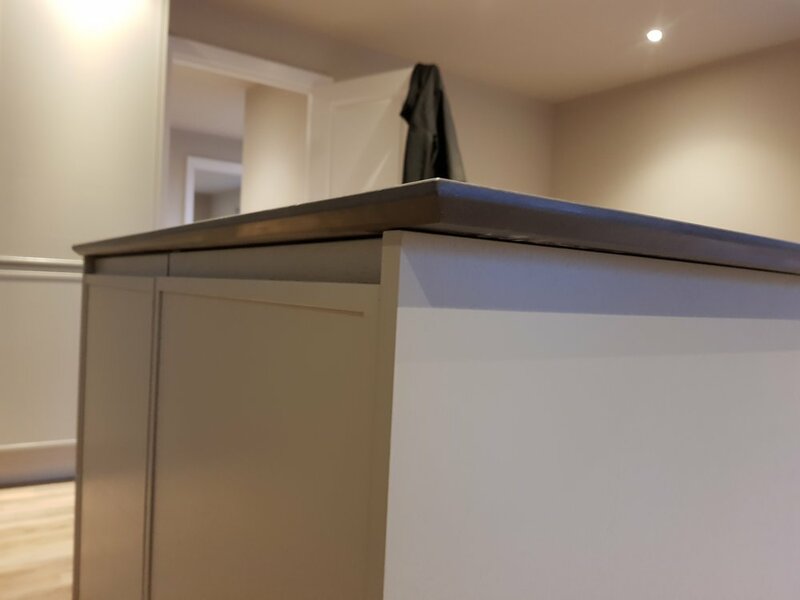 The worktop was a 20 mm silestone merango, with shark nose edging. NEFF appliances were used including the hide and slide pyro-clean ovens and the linear induction hob. Effective with style - these two flats were recently refurbished by our clients, using the porter range, with 20mm Silestone work surfaces. The appliances chosen were Siemens and Whirlpool. To enhance the the extra space the customer had created with this thoughtful extension, the customer chose a 1909 kitchen in the bold Hertford Blue colour. This was finished with a Silestone Nebula worktop. 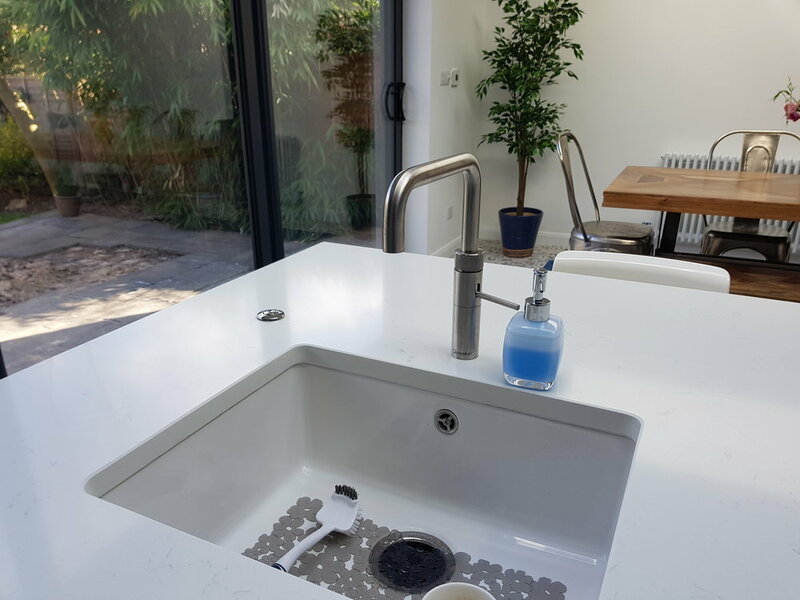 The Ceramic sink and a Quooker Fusion Tap were added to the island. Siemens appliances were chosen, including the FLEX Venting Hob. Elica Nicolotesla hob in stunning mixture of graphite and white with woodgrained open light boxes. 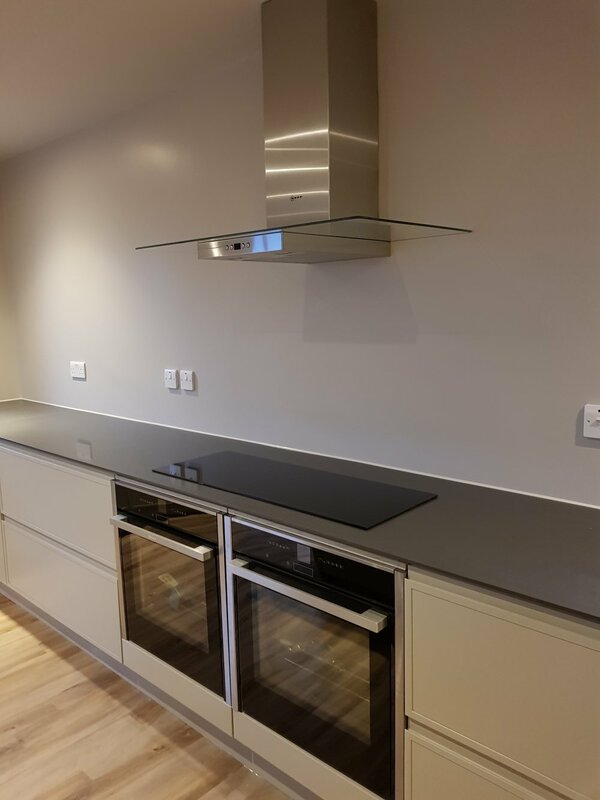 A 20mm raw concrete worktop from ceaserstone looked sleek with the white and graphite cabinets. 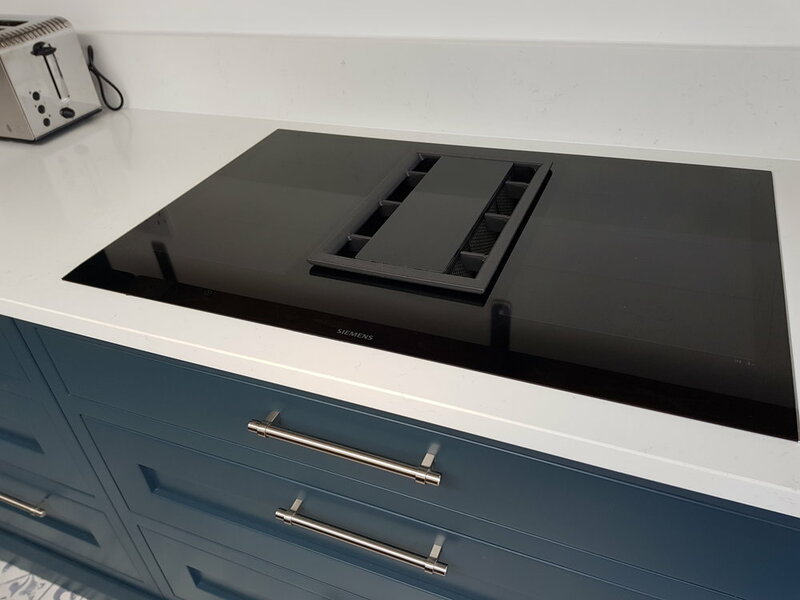 A new Elica Nicolotesla hob with integrated extractor made the room more functional as the eye line of the chef wouldn't be interrupted by an extractor. The kitchen was designed with a social breakfast bar with easy access to the wine cooler, A large american fridge freezer with ice maker, Neff oven and microwave combi gave this kitchen the latest technology available.